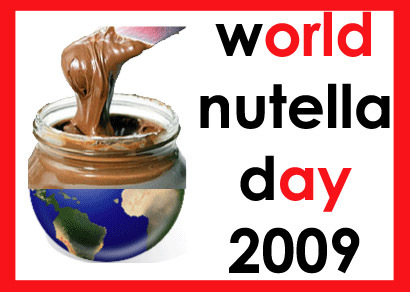 It’s that time of year again…time to celebrate the wonder that is Nutella with World Nutella Day! For those who don’t know, Nutella is more than just a “chocolaty hazelnut spread,” it is a way of life. From childhood memories to oozing hot crepes, from breakfasts on vacation to free-spooning sessions on the couch, Nutella is prominent in the memories of many children and grown-up children in the world. Two years ago we gave it its own holiday, and this year we’re continuing the tradition. Sara from Ms. Adventures in Italy and Michelle from Bleeding Espresso (and Shelley from At Home in Rome, in spirit) solemnly declare Thursday, February 5th “World Nutella Day 2009″ – a day to celebrate, to get creative with, and most importantly, to EAT Nutella. Take pictures and/or upload a video then blog about it ON February 5th, 2009. In your blog post, include links to Ms. Adventures in Italy, Bleeding Espresso, and World Nutella Day as well as the World Nutella Day 2009 badge/button (below). Please try to post ON FEBRUARY 5 so that we can create a true chocolaty hazelnut wave across the blogosphere on World Nutella Day! We will post the round-up of all submission on Monday, February 9, 2009, but in the meantime, please feel free to post this announcement on your blog to spread the word! Be sure to also add your photos to the Nutella Day Flickr Pool and your videos to the YouTube Nutella Day Station. You can also join the World Nutella Day Facebook group and follow @NutellaDay on Twitter! 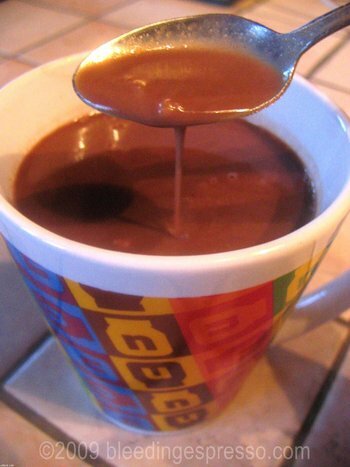 And now to kick things off, I’m going to share my latest Nutella creation, Italian-style Hot Chocolate with Nutella. I’ve written about Cioccolata Calda over at Italy Magazine, so do have a look if you don’t know what I mean by “Italian-style hot chocolate” (and see a great instructional video on how to make your own at home). Let’s just say Italian hot chocolate isn’t watery, more syrupy, even pudding-y if you like it that way. Ilva of Lucullian Delights also has a great recipe for dense hot chocolate. The recipe below is something simple that I whipped up the other day. You can add cocoa and/or espresso powder, a cinnamon stick, some vanilla, even peanut butter, but this is the basic recipe and technique. And it’s *so* good. 1. In a small saucepan, whisk together flour and milk and heat through, being sure to get out any lumps. 2. Add Nutella and bring to a boil, stirring to get the consistency you like. If you want it thicker, add more flour or cornstarch; if you want it thinner, add milk and use less thickener next time. 3. Pour into your favorite mug (yes, mine is a Nutella mug! ), and enjoy with a spoon. Be careful as it’s very hot! Now don’t forget to spread the word about World Nutella Day and get your recipes ready! And check out the rest of the What’s Cooking Wednesday recipes too! I always said hat this should really be a World Holiday! Enjoy your Nutella today. I have that same mug! I won two of them at my son’s school fair last year. Wow. I need to get organized so that I don’t miss the boat this year! You can do it Joanne! I picked up two of those mugs a few months ago–some promotion they were running, apparently. When I was in Calabria for the chili festival in Diamante, all the bars where offering shots of espresso with Nutella! Wisdom guaranteed! How can I NOT love you? It’s time already how is that possible? nyc/caribbean ragazza’s last blog post..Rome, why must you tempt me with your sales? I know…pretty soon you’ll have been here for a year, right? I have never, ever tried Nutella. I have lived in Eastern Europe for 10 years and passed by jars of it in the market but have never bought any. I have occasionally wondered, “What is that?” In honor of World Nutella Day, I will buy a jar and eat some!!! Woohoo! Can’t wait to see what you submit Dana! Absolutely…looking forward to your creation! I was just wondering about WND yesterday as I spread nutella on my toast! anne’s last blog post..Food Markets…..
Hope you can find some, City Girl! Liz’s last blog post..Pound Puppies. Yay, we’re starting again! I love it when newbies try Nutella for the first time for WND! FUN! Oh I remember this last year–I don’t know that I have anything to contribute but I love the other entries! I hear you, Michelle. Sometimes it’s just as much fun to sit back and enjoy the view…especially when there are Nutella recipes involved. Yum! Thanks for the invite Michelle and Happy New Year……a bit late. I would have loved to have created some sort of artistic piece for WND but my time is limited at the moment and I will be away at that time and won’t have computer access …(oops, hit the button too soon). Yes, there are still places where I can’t post!! Hope this finds you well and happy in Bella italia. You are not missing much here….cold and grey…but I can get Nutella in my local grocery!!!!Yay!!! karen cole’s last blog post..INSPIRATION OVERLOAD?? Karen, your presence is plenty! Be sure to come back around for the round-up of recipes on the 9th! Looking forward to your submission! Too funny because I only recently starting adding Nutella to milk for a more “American” hot chocolate, then I thought, hey, I could thicken this…. Oh, I miss Nutella!! With nut allergies in the family, this is one thing I don’t get anymore…maybe in honour of World Nutella Day I’ll have to sneak a taste 🙂 This recipe looks great! My favorite was freshly baked bread w/ nutella!! OMG!!!! I can never have that here because the bread doesn’t compare to that of Italy. Hey, do you think it is easy for someone to find a job in Italy that doesn’t speak Italian (my husband)? It *is* fabulous with fresh bread. As for the job situation, unfortunately in Italy, it’s not very easy for Italians to find jobs right now. It seems most non-Italian speakers here teach English. If you want to email me, please feel free! I was just thinking about Nutella Day and here it is! I am so excited its that time again. Can’t wait! Right on cue, Chris! Can’t wait to see what you come up with! I love nutella. What a fun idea. There are so many funny food holidays out there (National Croissant Day, National Peach Melba Day) – why shouldn’t there be a day for peach melba? You make an excellent point, Maris…. Oh my! This sounds delish! Deb R’s last blog post..It’s a cold, cold world! This is so weird that I’m finally finding time to get around to a bunch of blogs today and I read this post because I ate Nutella for the VERY FIRST TIME IN MY ENTIRE LIFE this morning. I kept hearing how wonderful it is so I picked some up at the grocery store last night and somewhat hesitantly spread some on a bagel this morning. OMG, why didn’t anyone tell me to try this sooner? It’s like heaven! Sauntering Soul’s last blog post..I think I have some sort of disease. And I think my mom finally had a date. She’s in denial. Oh, my… glad I made it to the blogosphere in time to be properly prepared! This hot chocolate looks heavenly! I think I might try making a nutella torte. jen of a2eatwrite’s last blog post..Where Am I? Darn it, I missed Nutella Day. I like it simple on white toast. You haven’t missed it Grace…it’s February 5! Come back for more! What a great event! Didn’t know this occured til Maryann sent me. Bummin’ now that my last post was a nutella dessert. 🙁 Perhaps next year. But I’ll be following your fun! If you’d like, just repost it (or at least the link) on Nutella Day and send it to us–we’ll include it in the roundup! I like that recipe. Thinking it’d go great with a hazelnut biscotti. Hey, hey! I love Nutella as a kid. Looking forward to your entry Fran! The 5th is WND so send it along! Noi italiani andiamo pazzi per la nutella!! che mondo sarebbe senza nutella?